An imitation can be defined as: The quality of an object in possessing some of the nature or attributes of a transcendent idea. (Transcendent is what is beyond normal experience). How long does it take to form an exquisite diamond or pearl of great price? How costly are these treasures? How pleasant is the process involved in the making of these precious commodities? Years in most cases - and more assets than our spreadsheets afford - with a life of darkness and pressure for the diamond - and a life of irritation for the oyster. People pay top dollar for the pleasure of owning them or having someone else see that they own them. The law of supply and demand says the more there is of something, the less it is valued. Diamonds and pearls are rare and precious, and costly because so. Most of us do not have them because we cannot afford the ideal or what is beyond "normal" experience. Some of us have been taken in by "knock-offs" or look-alikes (the price should have been the first clue, or perhaps the back door of the van). Oh, there is definitely a market for the unreal, and much of our society buys into it everyday. Imitation possesses some of the quality of the real thing and can easily fool the majority. It takes years of experiencing the real in order to detect the fake. Bank tellers are trained to handle the real money, so when a counterfeit passes through their hands, they can quickly stop its circulation. There is no way to view all counterfeits and then know what is real. That is too confusing. The ideal is learned first. When it comes to our horses, can we afford to mess around with imitation? It is one thing to be embarrassed because we were taken in by the guy in the overcoat ("psst, wanna buy a watch?"). It is another to continue to fool ourselves into thinking we've got the real thing. Don't our horses (and we too) deserve the transcendent, abundant, above ordinary experience? 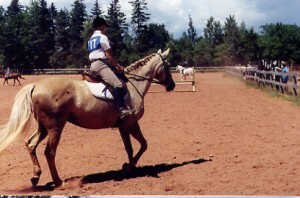 Learn all you can about horses and do not fall for following the "norm”, just because everyone else does it. Sure it is nice to fit in and not be different. But when fitting in means taking shortcuts, accepting as a rule the substandard behaviour and "training" procedures that are so prevalent, we do our horses and society a disservice. Just remember there is a bigger pond out there where things are done on a higher plane. There is no reason why we cannot exhibit the same real quality that many professionals do. Anything worth having takes time and struggle. If it is a "buy it now" offer, the price you pay is usually indicative of its worth. Do not settle for counterfeit. The value of the real thing only improves with age. You owe yourself and your horse better. "Store up for yourselves treasures in heaven where rust and moth do not corrupt".